Better late than never! I almost forgot to post today, but I'm glad I actually remembered before I fell asleep. It would have been horrible to make it to day 31 only to miss the last day! 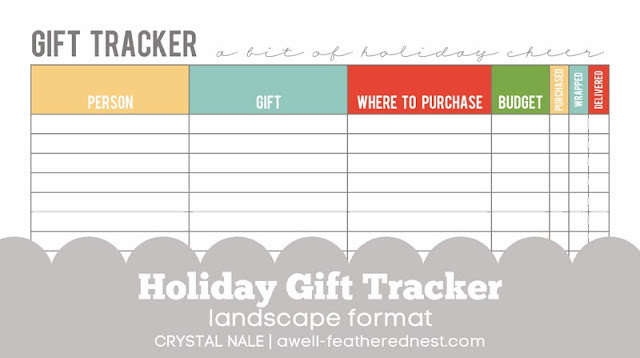 Today's free printable is a holiday gift tracker. Print this one out to keep a list of everyone you need to purchase gifts for, plan what you will get for them, and keep track of when it's wrapped and delivered. Maybe I need to add a category to help me remember where I hid them, too. Thank you for your 31 Days. I enjoyed it very much. Thanks! I'm so glad you enjoyed all the printables! 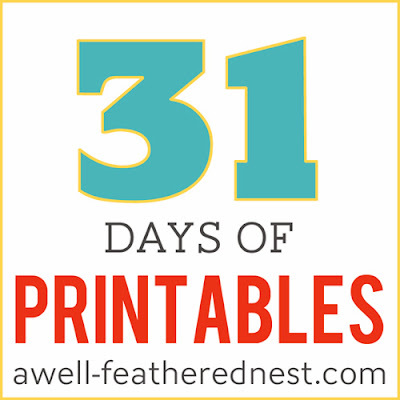 Thank you so much for sharing all these printables with us. I especially enjoyed the organizational ones -- love the colors and fonts you chose. And many of the more decorative prints are really quite cute. I know you must have put a lot of work into this series and I just wanted to let you know that I really appreciate your thoughtfulness and generosity. Thanks again.